To say that print advertising is dead does not convey the big picture. As with many other forms of communication, or businesses… print media needs only to evolve into something more in order to become current again. This has been a proven survival formula for “victims” of changing technologies: from the telephone to the iPad, from radio to television, and from movie theaters to DVDs, all have adapted to change and have reincarnated themselves into different configurations. Formats that are both alive and well, if not robust. So, what does this mean? It means that you must look at your target market to determine how to advertise. There might be one method that is better for your business, or maybe a balance of both is the best solution. Your client or customer experience doesn’t change, and neither does your SEO, orsocial media, or word-of-mouth marketing initiatives change. However, there are still situations and strategies that work extremely well for print advertising and direct mail. A prime example, are businesses that deal within a localized ADI (area of dominant influence). If you’re not concerned with dominating the entire world, but rather with acquiring “new” clients or customers at the local level, and if you’re one of those who would be very happy to just see a steady source of new leads from your local zip codes or trade area, then it makes sense to continue to keep print in your marketing mix. Even though there is no question about the viability, the potency, or marketing efficacy of the “new media” – the internet, smart phones, social media and any number of other technologies – it’s important for you to realize that they can rarely stand alone in the competitive struggle to grab the buyers’ attention. Are You Pushing or Are You Pulling? One of the biggest arguments in favor of maintaining a strong print marketing campaign is a variation on the old “push pull” theory of marketing. When a client asks me if they need printed brochures, direct mail, or print advertising, I tell them about the difference between relying on a viewer to “find” your website (“pulling” themselves to your message) versus actually holding your message in their hand, even if, at worst, it’s only for a few seconds (“pushing” your message at them in a way that can’t be completely ignored). The internet is an incredible tool for not only delivering information, but also for creating and inspiring action and reaction. So, it’s a given that a significant portion of any marketing budget has to be dedicated to digital marketing. The problem is that the successful execution of any internet marketing campaign is based on your ability to somehow convince your prospect to take some action. If they don’t click on something, request something, or in some similar fashion make a move to “pull” more information, you’ve lost that brief opportunity to “engage” them. OK, now let’s look at this comparison. Does an effective e-mail campaign accomplish the same thing as a printed direct mail campaign? You would think it should, but it really doesn’t! Why? Because you simply can’t just drop your e-message at every doorstep. And when you do get to them via their e-mail address, it’s a challenge to “force” the jaded recipient to take a couple of seconds to consider your message before they hit that “delete” key. It’s just too easy for them to wipe you and your offering from their already overstuffed inbox… and we all know that they do it without more than a glance. However, print advertising still provides an opportunity to place your message directly and physically into the hands of your prospect, even if only for a few seconds. Because those are the precious few seconds which all successful ad campaigns are dependent upon. If the message is right, if the graphics and headline are compelling, if you can intrigue, stimulate or motivate the viewer on first glance to take a second look, you have opened your selling opportunity. You have “pushed” your message into your prospect’s zone of consciousness. Take for example the “Corporate Capabilities Brochure”. An effective corporate brochure is still a critical component for most marketing plans. The ability to get your critical information into the hands of your prospects’ should not be dependent on their willingness to actively click their way to your website. What it really comes down to is your ability to “push” the information into their hands. A quality brochure, properly presented to a key decision maker, is difficult to ignore. It touches the senses, it has tangible value, and even to the younger executive who may be more attuned to technology, it stimulates. There are tactile, visual and explorative elements to print that can never be fully achieved on a screen. FACT: The four basic steps of good advertising have not changed – (1) STOP THE VIEWER, (2) ENGAGE THE VIEWER, (3) INFORM(or educate) THE VIEWER and (4) DELIVER THE OFFER. If you can’t grab their attention, you can’t deliver your message. 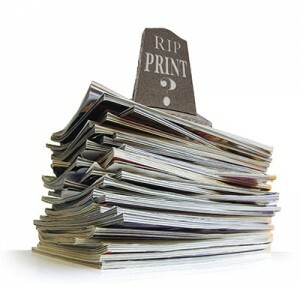 And print interrupts and engages in a way that digital media cannot. Clearly, the most effective use of any advertising budget involves an intelligent mix of both print and digital media.